-As of 8:00 CST, Motrin.com has been down for nearly 1/2 a day. I am literally in the middle of watching what Charlene Li and Josh Bernoff call a "Groundswell". As far as I can tell, Motrin posted an ad on their Website (see above) which ignited a community of mothers who were insulted by it. Specifically it seems that many of the mothers use baby slings and objected to the tone of the ad which describes them as "in fashion". As of 9:30 CST on a Sunday night, Motrin.com is down for the count. 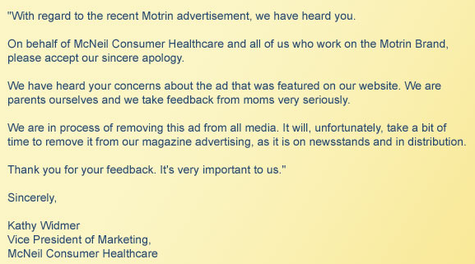 Motrin customers have already reported that an e-mail went out apologizing for the tone of the ad and took it off their site. The big takeaway here for me is that e-mail was the default vessel for communication because it can be utilized rapidly, but the Website can't. It's possible that the site went down due to server traffic, but friends in the field tell me this is unlikely. In the not-so-distant future, business and brands will need Websites that are as easy to update as blogs. You can quote me on this one. If you were to Google the words "Motrin + Mom" you will get results which look like the screen grab I took. 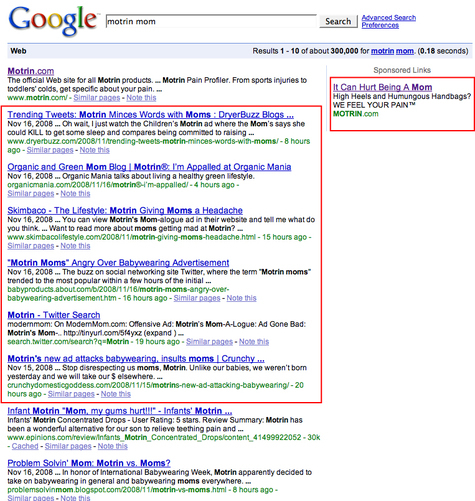 Google has immediately picked up blogs and Twitters and organically placed them in spots from #2 down. It's possibly that it will go to #1 shortly. 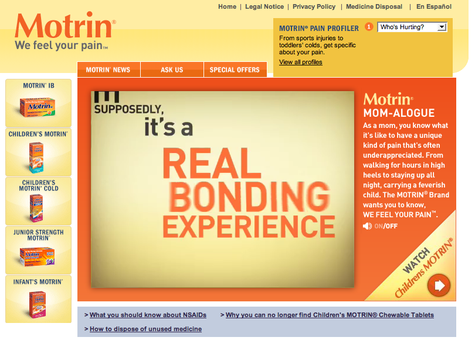 In the meantime, Motrin's purchased ads on the side make for an interesting comparison. No, it's not slick, it's not marketing and ad people can poke fun at the music as much as they want—it's a real response. Direct and genuine, whether you agree with it or not. And it was put up more quickly than most marketers could ever dream to produce content. The unofficial "motrin moms" took matters into their own hands, and they were heard by the community, outside the community, the search engines and by Motrin itself. 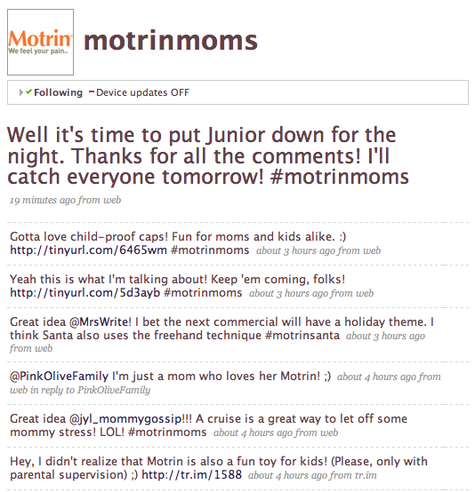 There's no mention of the upset moms, and in fairness to the Motrin brand, it's probably designed to handle marketing vs. PR. But of course those lines are increasingly blurring and presents an interesting dilemma for brands using Twitter which is how to leverage the presence in a communications crisis. If your site has to be taken down in order to respond to a crisis, re-design it so that it can be updated quickly and easily without having to throw your organization and agencies into a panic. Worry about your response strategy, not the design of your site. Look at how quickly the mommy community organized and produced an authentic video. It's because they don't have legal guidelines holding them back. You probably do—but of you can figure a way around them, you can fight authenticity with authenticity, which looks less like a fight and more like a conversation anyway. Aside from perhaps smoothing things over with the offended, the real incentive for any organization to engage in situations like this is to influence the search results and digital trail so that your organization presents well on them. The best way to do this is to have people saying good things about you which means you have to give them something good to say and can't force it. The end goal needs to be helping people. The ROI will be a much more positive long tail. My 2 cents, for what's it's worth. Hope it's helpful.